It’s no secret that my favorite fish is salmon. This garlicky sweet salmon dish is perfect for a quick dinner when the hunger pangs hit. But if you are in no hurry, a quick toss of rice noodles in a spicy citrus dressing makes for an excellent accompaniment to this dish. Imagine a crispy salmon skin with a hint of garlic and a sweet, melt in your mouth salmon on a bed of tangy and refreshing rice noodles. I just can’t wait to make more, but I need to get more Salmon as these were my last two fillets. 1. Clean your salmon under cold running water and pat dry with some clean kitchen towels. Set aside. 2. Combine the garlic, hoisin sauce, water and soy sauce into a small bowl and mix well. Once it is mixed well, brush the sweet marinade over the salmon and let it marinate for 10-15minutes. 3. Heat non-stick pan with a bit of olive oil or regular oil and sear the salmon skin side down first for 4 minutes. Turn the salmon over and continue cooking for another 3 minutes. 4. Let the salmon rest for 1-3 minutes before serving. You can eat the salmon as is with rice or go to the next recipe. It is quite easy to soften the vermicelli sticks. Conventionally, you would need to soak them in room temperature/cold water for a few hours until they soften but the process can be expedited with a quick bath and jostle in hot water, and then a quick immersion in cold water after to prevent it from being too mushy. 1. Prepare two large bowls, fill one half full with water and ice cubes. You want it to be extremely cold. On the other bowl, empty the rice noodle/vermicelli packet in. Also bring out a colander to catch the noodles after it’s quick hot bath. 2. Bring your kettle to a boil with 6 cups of water. Once the kettle is boiling hot, pour the entire content over the noodles. With a chopstick (or a fork), push the noodles into the hot water and stir it to loosen them up. The noodles will now be completely immersed in hot water, let it sit for 4-5minutes. 3. Pour the noodles in hot water over a colander, careful to not scald yourself and quickly immerse them in the cold bath. The icy cold water will bring bounce back into the noodles – stir to loosen the strands. Once that is done, pour the noodles in cold water over the colander again and drain well. Set aside. 4. In a large serving bowl (or the same large bowl used to carry boiling water and noodles), combine the seasonings together and half of the green chopped green onions. Whisk them for marriage. Add half of the noodles in (keep the other half of the unused noodle portions in the fridge for later use – add them to soups or make a stir fry). 5. Toss the noodles well and adjust the flavoring in accordance to taste. 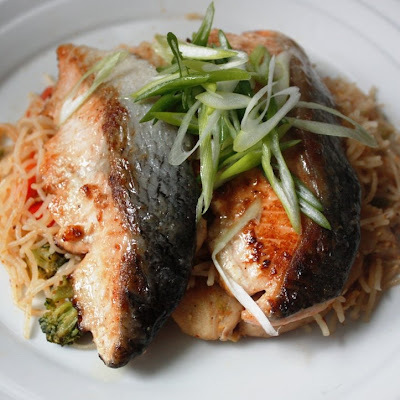 Serve the noodles with slabs of Garlic Hoisin Salmon and sprinkle the remaining green onions over the top. tigerfish: Yea it’s a hard fish to mess up! This salmon looks really delicious!! Its our favorite dish. Pilar – Lechuza: Hola! Thanks for dropping by. Salmon is one of my favorite fish too!